One thing I have never liked about 4X strategy games is the missing tactics. I never really understood why. Why cannot a game combine both – strategy and tactics? After all, quite a few generals became emperors! Since the beginning, I planned to create a game that would be a mix of these two worlds. 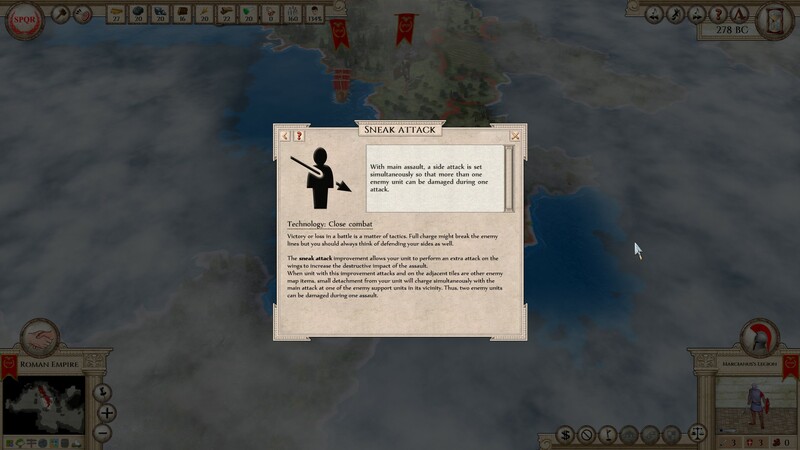 I didn’t want to go into low level tactics like the battles in Rome Total War but rather combine all the important aspects of battle tactics without the need to leave the strategic game map. No matter how grand and thought-out strategy you have, it is the actual battle that gets the adrenaline rushing through your body. So, how did we go about it? First of all, you should get to know your army and those of your opponents. Find their strengths and weakness and use them to your best advantage. 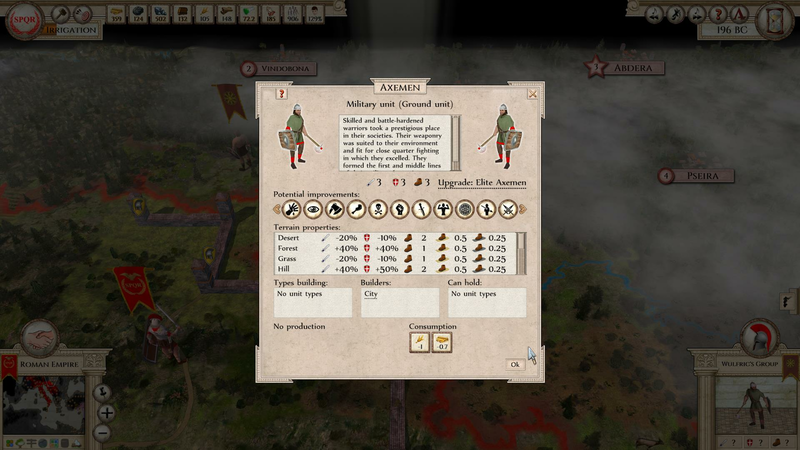 There are 5 army types in the game: Roman, Greek, Persian, Carthaginian and Barbarian. Their basic characteristics have been already shown in the previous Infographics but to summarize, each army type has 3 infantry and 3 cavalry units. Naval, mechanical and non-military units are the same for players. Each army type and every unit has a set of unique properties such as attack and defense strength, mobility, terrain adaptability, improvements, maintenance requirements, withdrawal probability, tenacity of fortification, and many others. Let’s start with the terrain adaptability. Every unit type has a default attack and defense strength but its actual strength can be considerably increased or decreased depending on the terrain where they are forced to fight. Every unit type is suited for certain terrains where they can fully use their training, formations, battle style or arms. The terrain adaptability therefore can give a unit a great (dis)advantage considering that the terrain bonus/penalty span from +60% to -60%. And quite similarly the terrain affects the unit’s movement range. To demonstrate the differences, we can use the example of Roman and Barbarian units. Barbarians are less disciplined and organized; their training forms strong individuals who excel in a man-to-man close combat in difficult terrains such as forests and hills. This environment is natural for them and they know how to behave and move around there. On the other hand, the Romans are well trained, disciplined and loyal. The rigorous drill prepares them for perfectly coordinated maneuvers in close formations that are extremely difficult to break. But they need wide open plains to use such formations. 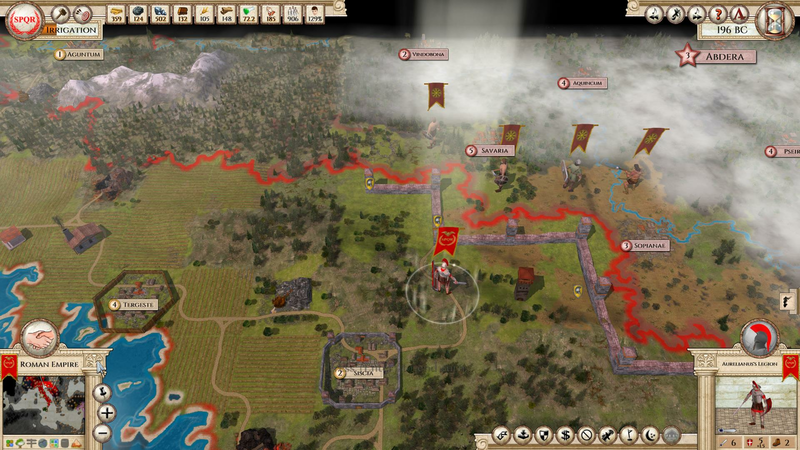 If the two armies meet on flat plains, the Barbarians will most likely be massacred as their wild even if strong attacks cannot break the solid wall of the Roman shields. Yet, if the two groups should meet in dense forests, the hit-and-run tactics of the Barbarians will have a clear advantage. You should carefully choose the location for your battles. Sometimes it is better to take few more steps around to gain a decisive advantage than jumping at first opportunity to attack. And sometimes it is even better to build a line of defense in a suitable place and wait for the attackers. Set the conditions right and you can pick them one by one when they charge. Even seemingly weak unit can put up very effective defense and inflict serious damage if it can use the knowledge of the terrain. Saying this, you should never fall in the trap of feeling safe! You can use some natural features of the terrain or the terrain itself to keep strong fall back positions. Rivers, hills, mountains, swamps and jungles are extremely difficult terrains that restrict mobility of units, compromise their fighting abilities and limit the chances of swift and surprising action. Positioning a fortified unit on such a tile means that the approaching enemy has to use extra force to break through which will cost him time and men and give you time to set the next trap. As you can see, terrain can have a major impact on the outcome of the military engagements if not planned well. You have to build your success on the strengths of your units that create the core of your armies. Every nation starts with unit(s) of one army type based on the military style they used. Romans start with Milites units and progress to Centurias and Legionaries. Barbarians start with Warriors and progress to Axemen and Elite Axemen. But you are not restricted to use units of your own army type only. If you conquer a city of another nation that uses different unit type, you will be able to incorporate these new units into your army as well. This way you can challenge your enemies on their own ground without losing advantage in unknown territories. Yet, it is not all as easy as it might sound. Conquering a city rarely makes the people there happy, not mentioning their eagerness to join the ranks of your soldiers. I already mentioned how loyalty works in one of the previous Dev diaries but to give you a quick summary – units recruited in cities with low loyalty are also less loyal, their general morale is low and all this has a great negative impact on their fighting abilities. So, you need to think twice when and how to use these units. This brings me to another game feature that I haven’t mentioned yet – improvements. There are currently more than 20 different military improvements that vary from the obligatory attack and defense strength improvements or those reducing terrain movement penalties, to some very special ones. Some of them can be gained only in a battle, others can be trained in cities which costs resources and time. It wouldn’t make sense to list all of them here but let’s just whet your appetite a bit. For example, unit with “Petrifying” improvement scares all enemy units stationed nearby which reduces their strength. You cannot give a unit such a reputation that intimidates the opponent before the battle even starts, the unit has to prove its worth in a war to earn its name. Another such improvement that you can gain only in a battle is “Homeland defender" which increases the defense abilities of a unit guarding a city or other populated places like blacksmith or temple. One of those that can be trained in advance is “Discipline” that increases the unit’s resistance to starving or irregular pay which would otherwise cause decrease in morale. Or “Mountain movement” that allows the unit to cross mountains that are otherwise impassable. Although crossing mountain ranges leaves the unit weak and takes very long even with this improvement but it is not impossible! You should always consider which improvements are needed for your military strategy and use specialized units in situations where you can maximize the benefit of their improvements. There is still much more that I want to include in this topic but it would be a long reading and I would have to skip over some minor yet very interesting features which would be a pity. That’s why it would be better to split it to two parts and I will continue in the next Dev diary! It seems pretty fun! Can't wait to play it! I don't know if this is the place to say, but I hope someday you guys make a similar game, but with battles like Pike & Shot/Sengoku Jidai. It would be like a completely turn-based Total War, which is something I've always looked for, but no one ever did, as long as I know. Each legion included a body of professional engineers, workers, craftsmen or artisans (called fabri) for siege work and the construction of bridges, roads, fortifications and other projects, placed under an officer called thepraefectus fabrum. 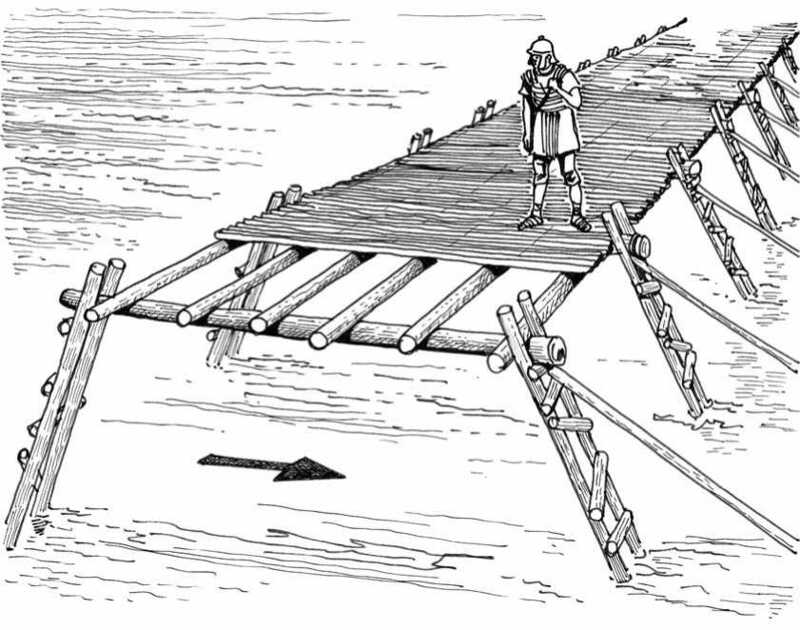 In wartime Roman engineers designed, built and operated siege machines. the Romans were adept at engineering them swiftly and efficiently!. Owing to knowledge and experience gained through routine peacetime and civilian engineering they also developed siege techniques. One of the most famous of such extraordinary constructions was the circum-vallation of the entire oppidum of Alesia, defended by the Gallic leader Vercingetorix in 52 B. C., within a massive length of double-wall — one inward-facing to prevent escape or offensive sallies from the city, and one outward-facing to prevent attack by Celtic reinforcements. This wall was estimated to be over 13 miles (20 km) long. The Roman engineer corps also built roads and bridges. When invading enemy territories, and later when countries were conquered, the Roman army would improve or create means of communication in order to allow swift reinforcement and resupply, as well as a path for easy retreat if necessary. Roman road-making skills were such that some Roman roads survive to this day. The Roman army was also involved in building projects for civilian use such as the construction of town walls, the digging of shipping canals, and aqueducts. Caesar’s bridge across the Rhine. Caesar’s bridge across the Rhine. The first two bridges to cross the Rhine River were built by Julius Caesar and his legionaries during the Gallic War in 55 b. c. and 53 b. c. Strategically successful, they were considered masterpieces of military field engineering. 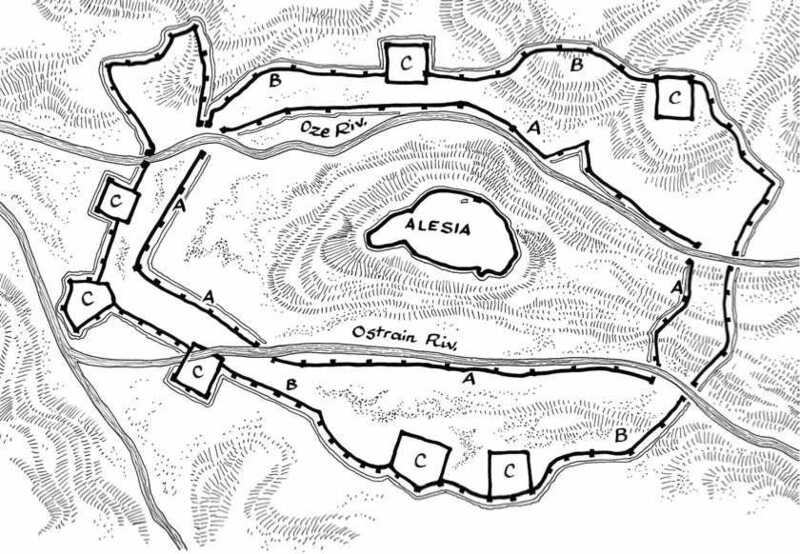 Siege of Alesia, 52 b. c.
Siege of Alesia, 52 b. c. It marked the turning point of the Gallic Wars in favor of Rome. The siege is considered one of Caesar’s greatest military achievements, and is still one of the classic examples of siege warfare. As the Romans were outnumbered by five to one by a coalition of Gallic tribes commanded by the leader Vercingetorix, Caesar ordered the construction of double-walled structure which included mounted/emplaced Artillery in the fortifications that were included in the wall. The double wall was constructed at Alesia in order to blockade or keep the Gallic force trapped...to keep them from breaking out and also the Outer-Ring of the wall was used to keep the Relieving Gallic Force from coming in...to rescue or aid Vercingetorix. The cir-cumvallation was about 18 kilometers in length, and consisted of a 4-meter-high earth wall and two 4.5-meter-wide ditches, about 1.5 m deep, and regularly spaced timber watchtowers equipped with artillery. These fortifications were supplemented with mantraps and obstacles in front of and in the ditches, creating a dangerous killing zone. Anticipating that a relief force of 258,000 would be sent to rescue the besieged, Caesar ordered the construction of a second line of fortifications, the contravallation, facing outward. The second line, intended to protect the besiegers (Roman's), was identical to the first in design and extended for 20 km, including infantry and cavalry camps. Although the Gauls launched massive attacks to break-out of the entrapment, the Romans, well entrenched behind their field fortifications, ultimately could both repulse the relief army and obtain the surrender of Vercingetorix by starving his troops. A: Countervallation; B: Circumvallation; C: Roman infantry and cavalry camps. 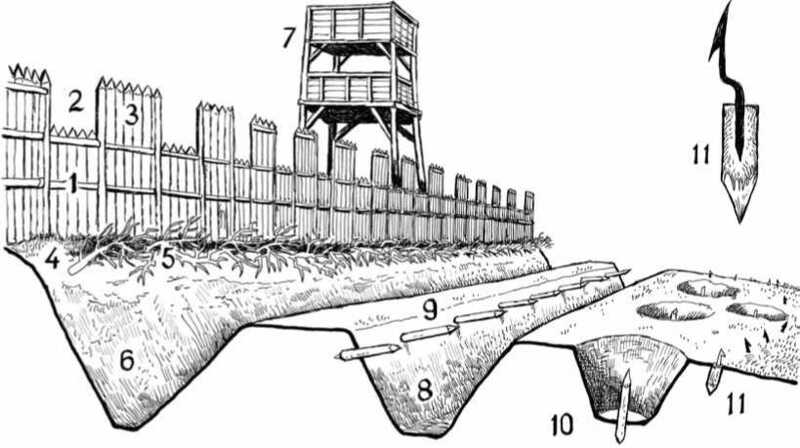 1: Lorica (parapet) made of palisade poles; 2: Pinna (crenel or void); 3: Merlon (upstanding solid sections of a parapet between the crenels, behind which the defenders could shelter); 4: Vallum or agger (earth wall); 5: Cervi (sharpened tree branches acting as obstacle); 6: Fossa (ditch) 7: Turris (tower with artillery); 8: Second ditch; 9: Cippe (sharp poles); 10: Lilium (wolf’s pit-concealed interlocking conical excavations about 2 meters in diameter and 2.5 meters deep in which one or more dangerous sharpened stakes or spikes were placed); 11: Stimulus (a sharp barbed iron hook fixed on a short stake stuck in the ground, concealed in grass and planted in great number around a position, intended to injure attacking enemy infantrymen and horses). What were the greatest battles in Roman military history? What was unique or impressive about the battles? Did the Romans have to use any unconventional means to win them? Were there any brilliant moves by the generals? In its course of conquest over centuries, from kingdom to republic to empire, Rome had fought innumerable wars, but it has never been tested as it was in the last two decades of the third century BCE, during the Second Punic War. Fought over two continents with victories and defeats on both sides, the war witnessed various defensive and offensive tactics in battle, deployed by some of the greatest generals of all time. These are some of the brilliant battles that formed the campaign. This was Rome's first proper test against Hannibal Barca of Carthage, and it failed miserably. Hannibal set up camp from across the river Trebia from the Roman camp under consul Sempronius, and at the same time sent a detachment under his brother Mago to hide in the underbrush. On a snowing winter day, a goaded Sempronius marched his heavy infantry over the freezing cold waters of the river to face a well-prepared Carthaginian army. Unable to even hold their weapons properly, the Roman offense was shattered. With the bulk of legionnaires on the other side of the river, the Roman cavalry chased off, and Mago's detachment cutting the retreat, it was a massacre. One of the greatest examples of Hannibal's military genius, the Battle of Cannae silenced the might of Rome for years. After being defeated in major battles by trickery and deceit, Rome decided to ensure that the battle happens in open ground. Realizing the threat posed by Hannibal, they managed to muster a large army from their legions as well as their allies. Heavily outnumbered against the superior Roman heavy infantry, Hannibal's thin line of allied infantry was retreating from the beginning of the battle. On either side of this melee, the Roman cavalry found themselves outclassed by Hannibal's cavalry, and were summarily routed. The Roman infantry, laboriously pushing forward, failed to notice the enemy cavalry coming at their rear. Nor did they see Hannibal's reserve African infantry forming up on either flank. Not until the encirclement was complete, and total annihilation began. Never had the Roman army been so chastised. The Battle of Ilipa (206 BCE) - With Hannibal unable to storm or lay siege to Rome, and Rome lacking the strength to face Hannibal in the field, the years following Cannae were of attrition and maneuvering than anything else. Rome was also involved in the First Macedonian War around that time. Meanwhile, after unsuccessful attempts to subvert Carthage's influence in Iberia (Spain), Rome witnessed the rise of Publius Cornelius Scipio, later given the title Africanus. After the capture of New Carthage and chasing off Hannibal's brother from the region, Scipio faced his first major challenge against reinforcements from Africa. There were a number of pre-battle skirmishes between the Roman-Iberian army and the Carthaginian-Iberian army, with Scipio always going for the same formation. On the day of the battle, Scipio reversed his formation and shattering the battle plans of the Carthaginian generals. In a remarkable turn of events, Carthage's forces were subjected to the same treatment the Romans received in Cannae, with Scipio's "reverse Cannae" maneuver. Hannibal already stranded without reinforcements in Italy, Scipio broke his backbone at New Carthage. The Siege of Alesia(September, 52 BCE) – One of the greatest victories of Julius Caesar, this battle marked the end of the Gallic Wars and cementing Roman authority all over Gaul. The leader of the coalition of the Gauls was Vercingetorix, who was holed up inside the hilltop fortress of Alesia. With a smaller army than the garrison, Caesar knew that storming the castle wasn’t an option, and he decided to starve them out. A massive construction project began, circling the entire fort with walls and trenches spaced with watchtowers as a fortified circumvallation. The skirmishes of the scout cavalries notwithstanding, Caesar received information that a huge Gallic cavalry will soon be on its way. Before the reinforcements arrived, the Romans built a defensive wall around them – the contravallation. Not long after, the starving garrison launched an attack from the inside, while the relief cavalry mounted an attack from the outside. The legionnaires were spread thin in holding the breaches on all sides. The relief army broke in, and in a bold move Caesar committed the bulk of his cavalry against the relief cavalry, attacking them from the rear and defeating them. Vercingetorix surrendered after that, and Gaul was now under Roman dominion. Reconstruction of the rampart of the circumvallation at Alesia (France). The Battle of the Teutoburg Forest (9 CE) – One of the major clashes during the long history of the Roman-Germanic wars, Teutoburg forest witnessed the systematic ambushes, attacks and overall guerilla warfare inflicted on advancing Roman legions by the coalition of Germanic tribes under Arminius. It was a resounding victory for the Germans, resulting in the total destruction of three Roman legions, and establishing the river Rhine as the border between the Roman Empire and the tribes of Germania.